CHATHAM — With the bases empty, Brewster Whitecaps starting pitcher Reid Detmers (Louisville) was a strike away from ending the bottom of the second inning. He had already allowed a run earlier in the frame and looked to be clear of any further trouble. Even after his payoff pitch to Kyle McCann (Georgia Tech) sailed wide of the strike zone, he still had two outs in his favor. The free pass brought A’s leadoff hitter Blake Sabol (Southern California) to the dish, who continued his searing streak of hitting. Sabol slapped a single to right, his seventh hit of the postseason, to put runners on the corners. The next batter, Spencer Torkelson (Arizona State), made Detmers pay for failing to shut the door. With a 3-1 count, Torkelson catapulted the ball high into the sky before it collided with the trees beyond the left-center field fence. Dominic Canzone (Ohio State) and Hunter Bishop (Arizona State) tracked all the way to wall but could only look up as the ball cleared the fence with ease. Torkelson’s three-run shot was one of five homers that powered the Anglers’ (3-0) to a 11-6 win over Brewster (2-1) in Game 1 of the East Division Championship Series on an overcast Wednesday at Veterans Field. “This ballclub is pretty good against right-handed pitching,” A’s manager Tom Holliday said. “They've grown together, they have their own personality. That personality is built around home runs." Chatham’s five long balls are the most it has sent out of a ballpark in a single game during the 2018 summer. Torkelson slugged another homer in the fifth, his second of the night. John Rave (Illinois State) then clocked a one-out round-tripper in the sixth that crept over the right-field wall. On the first pitch of the next frame, Sabol smacked his second home run of the playoffs. Four batters later, Colin Simpson (Oklahoma State) roped a two-run homer more than halfway up the hill beyond the right-field wall, nearly reaching Depot Road. By the end of the home run derby, the home team held an 11-2 lead. Chatham’s flurry of runs began in the bottom of the first inning, as Sabol singled to center on the very first pitch Detmers threw. Michael Busch (North Carolina) then drove Sabol in with a bloop single to shallow left that evaded a backtracking Cameron Eden (California) and an oncoming Canzone. The Anglers doubled their lead moments into the second inning. Greg Jones (UNC Wilmington) laced a double to left-center on the first pitch of the inning before swiping third base. A Jorge Arenas (Stetson) groundout scored Jones to give the A’s a two-run advantage. Jeff Belge (St. John’s) — who was the losing pitcher in Chatham’s season-ending loss in Game 3 of the 2017 East Division Series to the Orleans Firebirds — made his first start of the playoffs. For three innings, he was lights-out, striking out three and allowing no hits. In the third, Belge’s struggles began. Two two-out walks loaded the bases for Brewster before Belge worked a full count to Conor Grammes (Xavier). A ball away from handing the Whitecaps their first run, Belge fired a low fastball that Grammes whiffed at, concluding the inning. Over the next two frames, Brewster smoked two solo-shots — from Alejo and Jesse Franklin (Michigan) to narrow its deficit. The long balls brought Belge out of the game and John McMillon (Texas Tech) into it, who provided his best outing of the season. McMillon showed solid command and stayed composed on the mound — something he has struggled to do this summer — to hold Brewster batters at bay as the A’s built their lead. The right-hander tossed 3.2 hitless innings, striking out six and walking none. The visitors tallied four more runs in the ninth — a solo homer off the bat of Christopher Wright (Bryant), an RBI single from Johnny Tuccillo (Stony Brook) and a two-run single from Justin Ammons (Tennessee) — off Joseph Lowder (Appalachian State), who relieved McMillon to start the ninth. The victory marked Chatham’s first of the season against the Whitecaps at Veterans Field after losing all three regular season matchups. 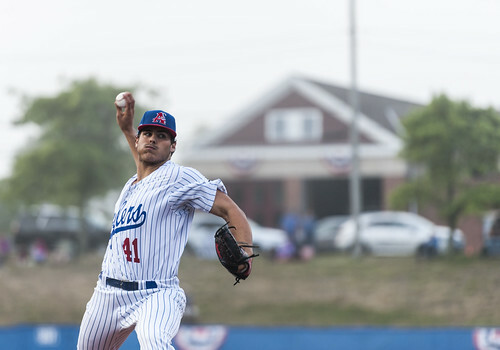 In Thursday’s Game 2, the A’s and Brewster will face off at Stony Brook Field, a venue where the Anglers went undefeated in the regular season. "That was a very good offensive game,” Holliday said. “I hope we didn't score too many tonight."